F. n Maria Schumm Jr. Here rests in God, Louise Justine, little daughter of Fr. 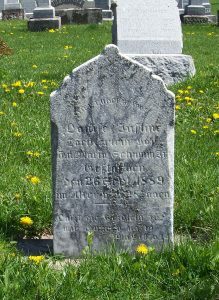 Maria Schumm Jr, died on the 26 September 1889, in the age of 28 days. According to Zion Schumm’s records, Justine Louise Schumm was born 30 August 1889, the first child born to Friedrich Jr. (1844-1907) and Maria (Buechner) (1861-1930) Schumm. This was Friedrich‘s second marriage, his first wife being Margaret Ehrenman (1847-1885). Justine was baptized at home on 8 September 1889, with Wilhelm Buchner and Louise Schumm serving as her sponsors. 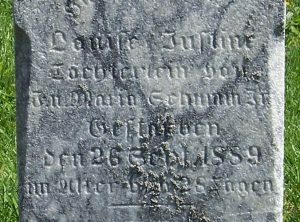 Justine died at 3:00 in the afternoon of 26 September 1889 and was buried on the 27th. Her funeral text was Mark 10:13-16. This little girl’s identity has been somewhat confusing and a bit of a mystery. I actually had her listed twice in the Schumm database–listed as Louisa Juliana, with her parents as Jacob Friedrich and Maria (Germann) Schumm. And as Louisa Justine, with parents as Friedrich Jr. and Maria (Buechner) Schumm. I consulted Zion Schumm’s records, where both her birth and death are recorded. Her name was Justine Louise in both entries and both entries indicate she was the daughter of Friedrich Jr. and Maria (Buechner) Schumm. Both entries also indicate she was born on 30 August 1889. 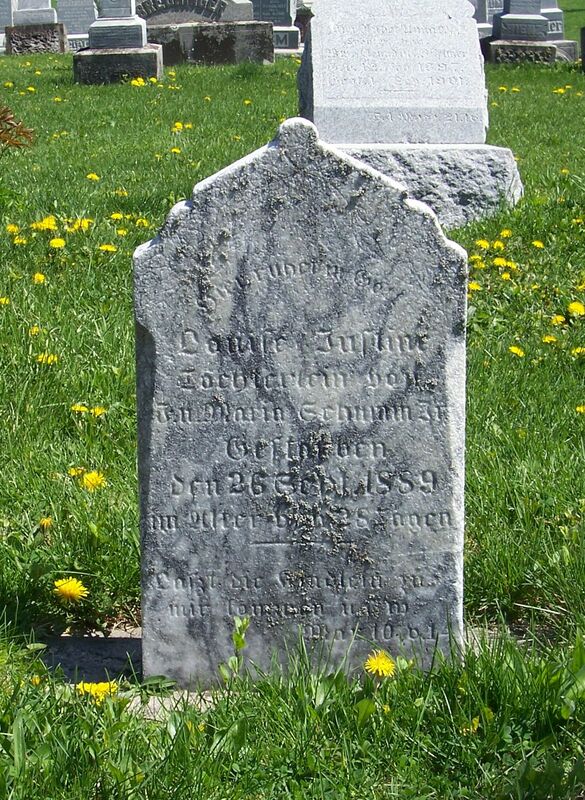 Because her tombstone is so difficult to read, because of the script and the weathering, the “s” in her given name was read as an “l” and her name was read as Julliane some years ago for the Van Wert Cemetery Inscriptions Book. But the inscription is Louise Justine. I have corrected her parentage in the Schumm database, for I believe, going by Zion Schumm’s records, that she was the daughter of the Friedrich Jr. and Maria (Buechner) Schumm. 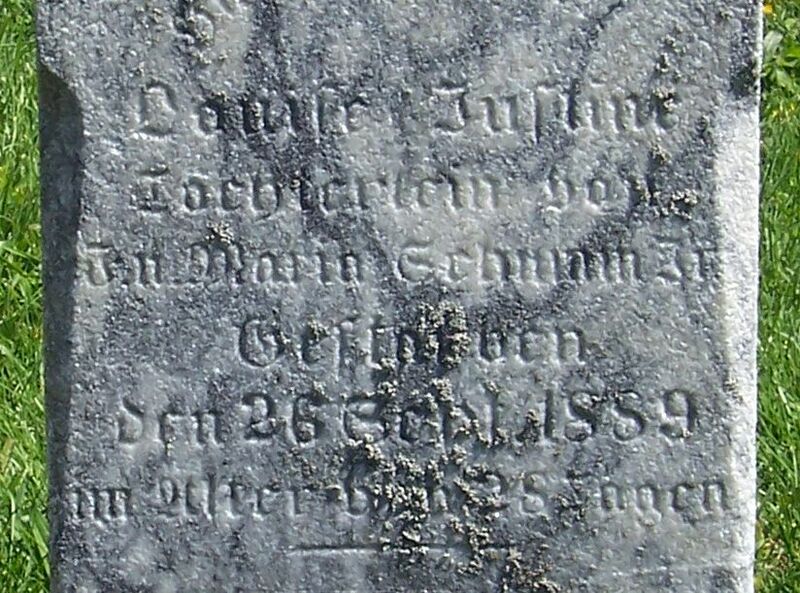 Examination of the tombstone and the church records show her name to be Justine, not Julliane. There is no Louise Juliana Schumm in Zion’s records. That seems to confirm her name and parentage, but there are still other questions. Zion Schumm’s records indicate two times that her date of birth was 30 August 1889, but her church death/burial record indicates that she was 3 months and 6 days old when she died on 26 September of that same year. That does not add up! And the tombstone is illegible for that part of her age. I think the pastor may have recorded her age wrong. I also checked FamilySearch, but did not find a probate birth or death record for her.